It was a rainy day, but we were blessed with just an overcast sky! For that, I thanked Kabunian for a nice and cool weather. Otherwise, with slippery roads, it would have been difficult for us to go up to Timbak, Kabayan, Benguet to see the mummies it is known for. With the rugged road going up, one mistake would definitely bring us several hundred meters down the steep and deep ravines. But Ronan, Atok's municipal librarian who generously drove us to the place, has very skillful hands. He drove like he knew the road by heart. He knew when to turn, pump up the gas, and when to step on the brakes. Needless to say, I was uneasy on the front seat of a rickety van. I was forever holding my breath till we reached the place at the zenith and at the end of the road. And we were thankful we are the only one who drove up and down the single lane dirt road. A few hours earlier, I was hoping we would see Apo Anno, the famous century-old mummy, which has been stolen and rumored to have been bought by a benevolent rich man back to its resting place in Sitio Nabalikong, Buguias, Benguet. It was much farther from Atok, Benguet from where we came from. Timbak, a barangay of Kabayan is just a few kilometers away from Atok, Benguet. Anyway, the trip to Timbak was not that all bad. Going up there feels like one can almost touch the heavens. The mist-covered mountain was a refreshing sight. The stunted trees and shrubs, exotic and unfamiliar fern species and mosses on the rocky mountainsides give you a hint of its high altitude. I would say it was cold up there even in the middle of the day. Along the way, Shasta daisies lining up the dirt road, lilies along the small canals and waterways, and wild berries were simply breathtaking! Of course, we stopped to pick up and eat some berries--red and yellow of them! The red ones, which are bigger in size, taste much better than the yellow ones. It felt like I was a child who was in awe of this these simple pleasures. Upon reaching the end of the road, Ronan, dropped by in the lone house that stood near a cliff to get something and wrote our names on the log book, while I took photos of the mountains on the other side, which I learned to be Mount Pulag. The view was simply breathtaking! Later on, Ronan told us he got the key to the tomb. Apparently, the place was a private property, and they locked the caves to prevent vandals and foil mummy thieves. Going to the place was easy, as we only descended almost only a hundred meters down the stone steps leading to the tombs, which happen to be just small cavities in between big boulders. As Ronan unlocked the grills that guard the tombs, he talked to the spirits, telling them we were visitors and asked permission from them that we will take their photos. It was enough for me to see them in their small wooden hand-carved coffins, but Ronan already asked permission from the dead that we will open the coffins so that we can look at and photograph them. I was hesitant at first. I have seen the hanging coffins of Sagada, but I never had the chance to see the mummies inside. Admittedly, I was shivering. I didn't know if it was the cold air or the act of photographing a mummy itself. Perhaps, both. I took quick shots because the place was really so small and cramped that we stooped so low just to see them. There were also relatively new coffins inside, which means there were new burials that happened in the recent past. Inside, it was musty, but without a stench of rotting human flesh. It was eerie, though. And I imitated Ronan, who was talking to the dead. I uttered some words and thanked them, too! We rested a bit. There were some concrete benches in the area. 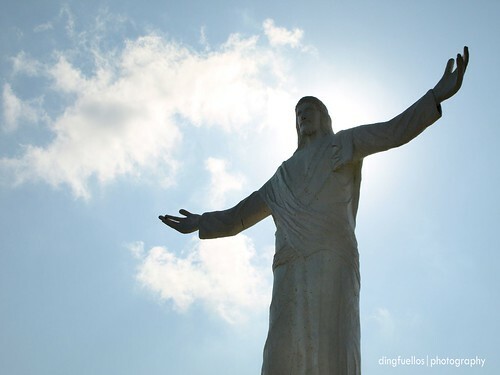 Earlier, they allowed picnics in the area, but then, the relatives of the dead and the municipal authorities no longer allowed unguided visitors to keep the burial grounds sacred. We wanted to linger, but the rain was forthcoming, so we began our winding ascent to the road, which proved to be a challenging one. With an untrained pair of lungs, we found ourselves panting and catching our breaths in the thin air. Save for some landings, we were able to take a few minutes rest, until we finally reached the road--no sweat! [pun intended]. Note: Except for some families in Sagada and other remote communities, residents of Kabayan, particularly those who were schooled, already bury their dead for sanitation and health reasons. 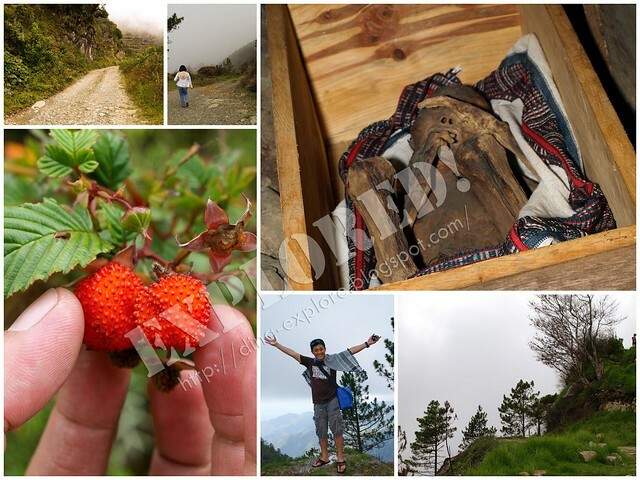 Below is a slideshow of the photos I took from this short trip to Timbak, Kabayan, Benguet.